No screens, no chores, no distractions. Fresh air, stunning scenery, moonlit stars. It all sounds too good to be true, right? 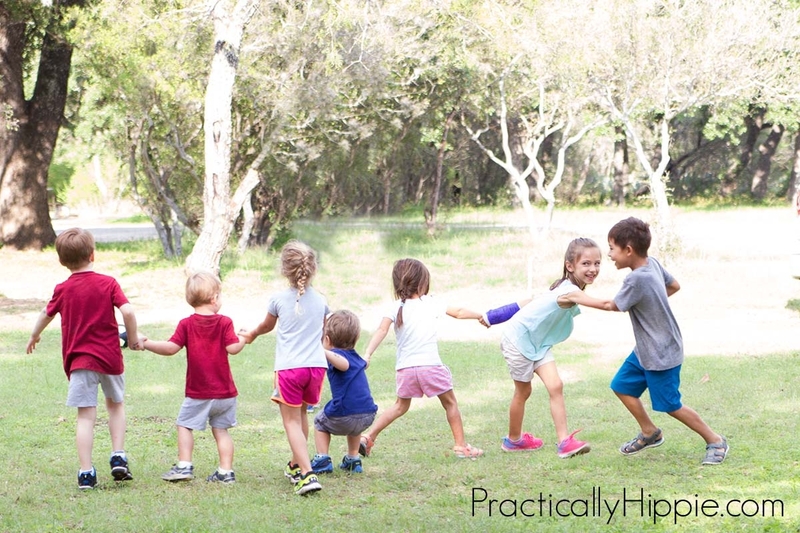 Camping allows us to connect with the Earth in a special, fully immersed way, which is SO IMPORTANT for kids. It’s an experience not to be missed, even when you start having kids. We embarked on our first family tent camping trip with a 6 year old, 3 year old, and 10 month old last weekend. I was pretty nervous, but the trip was a big success. Sure, we made some rookie mistakes. Like bringing an air mattress that was too big to fit through the tent door! But part of the fun in camping is “roughing” it and making do with what you have. We camped with a group of friends who are expert campers, and if you know anyone who has camping experience, I highly recommend tagging along on a trip with them! There are so many little odds and ends that seasoned campers have that you probably don’t want to invest in for your first trip. It was nice to know that we’d still be able to eat even if I forgot something important (hello fireproof gloves, never even crossed my mind!). Camping with kids can be stressful because there is fear of the unknown. Kids have basic needs whether they are at home or deep in the woods- shelter, food, clothing, and entertainment. The trick to camping is to meet those needs with the least amount of extra equipment possible. 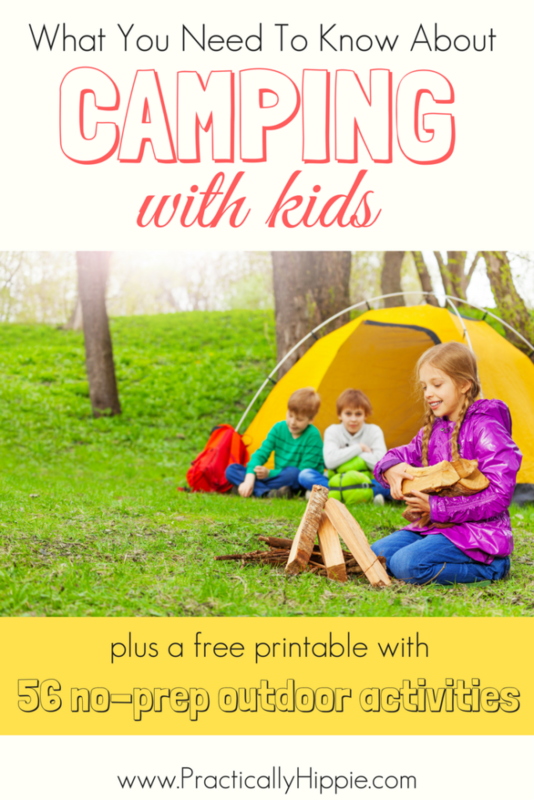 Here are some tips about camping with kids and what they really need to make your family campout a great one. Obviously, you’ll need somewhere to sleep. Kids and sleep are usually a tough combo. At home, my three kids each sleep in their own rooms, with blackout curtains, ceiling fans on, sound machines, with two pillows and a lovey. Sleeping under the stars means compromising on some of those luxuries, but sleep is not an area you want to sacrifice completely. 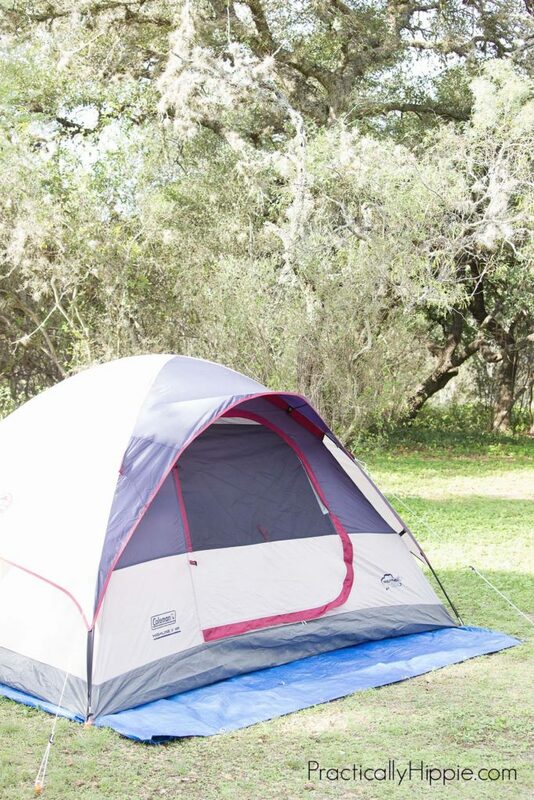 TENT: Find a tent, or two, that is big enough to accommodate your family. If your kids flail around at night like mine, a 4-person tent is really for 2 people. Go big or go home. If you have a baby or a light sleeper, you might even opt for two separate tents like we did. PADDING: Air mattresses work great for making the hard ground a bit more comfortable, especially the elevated ones. For kids, sleeping bags are probably enough padding. BABIES: If your baby is used to sleeping in a crib, bring a pack n play along for a safe and comfortable spot for baby to sleep. PILLOWS: We brought one pillow per person plus an extra for my husband- that’s 5 pillows! I read a tip to bring empty pillowcases and stuff jackets or clothes inside when you get there to avoid having to bring so many pillows- genius! LOVIES: If your child has a lovey, don’t forget it! I made sure my kids left theirs in the tent during the day because I didn’t want any accidents that would affect our sleep at night. SOUND: Bring along a battery-operated sound machine if you think camp noise might keep your kids awake. Even though ours stayed up late until after 9 p.m., there was still a lot of noise from other campsites until closer to 10:30 p.m. Kids love snacking. The thought of being away from a refrigerator or having the convenience of scouring the pantry for a snack can be a little nerve-wracking. 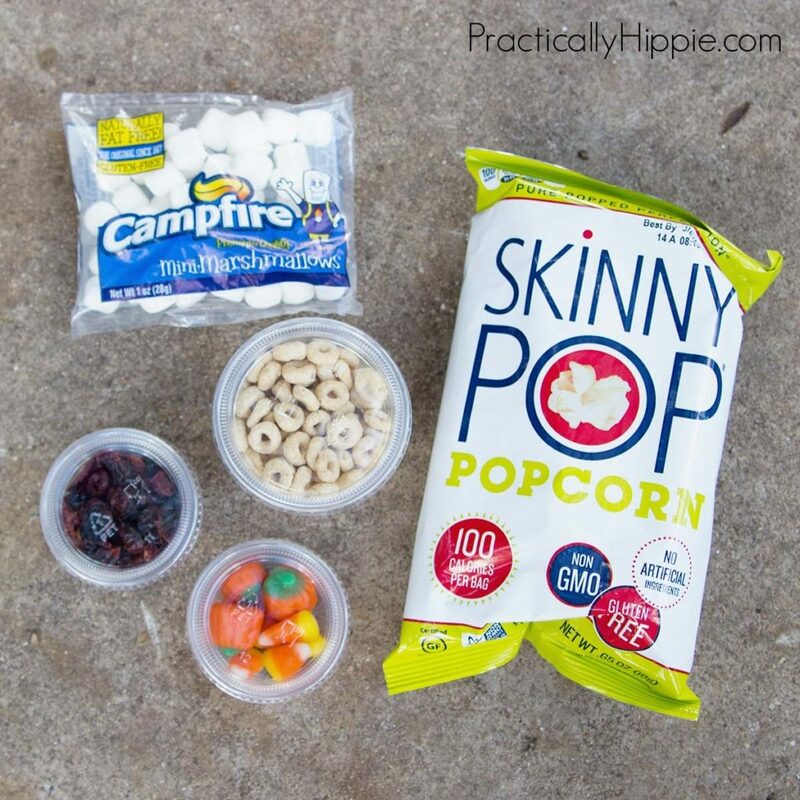 The key to camp food is to keep it simple, and plan to bring just enough for meals and scheduled snacks. BREAKFAST: I’ve got one kid who needs to eat right away, one kid who likes to wait a while before she eats, and a baby who is really needy in the morning. Easy no-cook breakfasts were a must. We packed refrigerator oatmeal (pre-made at home and chilled in the cooler) and cooked pancakes (eaten cold). LUNCH: Camping usually means hiking, swimming, or other fun activities so my kids were ready for a hearty lunch. I had some pre-cut veggies and hummus ready for them to start on while I prepped the main meal. DINNER: We didn’t get to the campsite until after 4 p.m. so I knew dinner on our first night would need to be easy. I prepped simple campfire meals in tin containers that just needed to be heated over the fire. If you know your kids are needy during this time, this is a great option! DESSERT: Camping is never complete without s’mores! We did s’mores one night, and a simple berry and whipped cream dessert on the second night. SNACKS: Pre-packed snacks in reusable containers or snack bags. One of the other moms in our group put together a cute DIY trail mix snack for the kids that was a huge hit. A note on how kids eat while camping. We brought along a kids’ table and a high chair, which might seem excessive. But I wanted a safe place that I could put the baby down to eat, and my 3 year old does a lot better at a kids’ table vs. picnic table with benches. We also brought a set of child-sized utensils and a Thermos straw cup for each of them. Camping means dirt and that means filthy kids. I feel like my standards on clean clothing lowered a lot while camping. One outfit a day plus one extra in case of emergency was completely sufficient for my bigger kids. Babies who spit up, have diaper blowouts or drool will obviously need more, but this is an area where you definitely don’t need to go overboard. 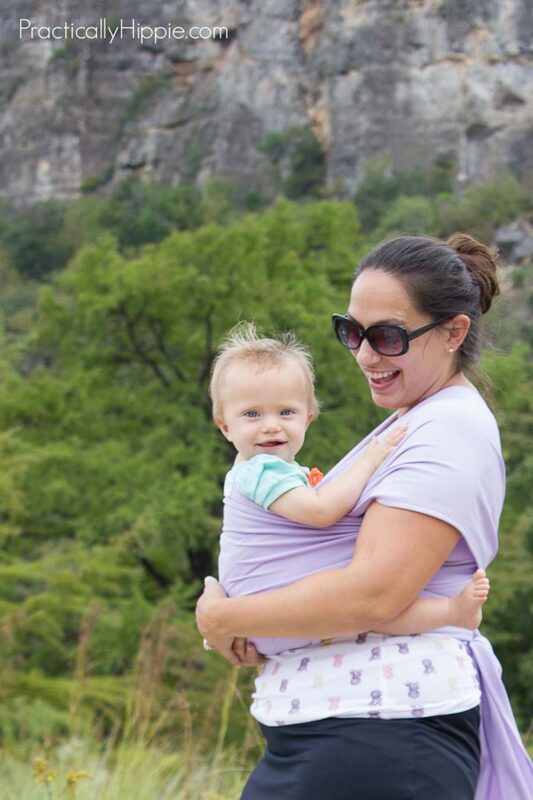 While it’s not clothing, don’t forget baby carriers for your babies and toddlers. I brought along my Boba 4G carrier to use around the campsite and for any hiking. I also brought my Beachfront Baby Everyday Wrap for swimming and to keep cool during the heat of the day. Kids love being outside, and camping is an excellent opportunity for them to be fully immersed in nature. Depending on their ages, kids aren’t going to be able to run around and play in the dirt all day. BABIES: For very young babies, you might find some kind of baby holder like a rock n play is necessary. For babies who can sit unassisted, an outdoor blanket will probably be just fine. I love letting my baby sit right on the grass and experience the Earth on her skin, but if I’m not sitting right next to her and I don’t want her to eat all the acorns, a blanket is a must. TODDLERS: Toddlers like to stick close to mom and dad so try setting up a couple activities close to where you will be cooking or relaxing. We set our some crayons and paper on the kids’ table, and one of the families brought some construction trucks and bubbles that were used throughout the weekend. BIGGER KIDS: Bigger kids will love the freedom to explore and create their own adventures outdoors. As long as they are having fun, let them! If they need a little inspiration, this is a great time to offer simple materials for nature activities. 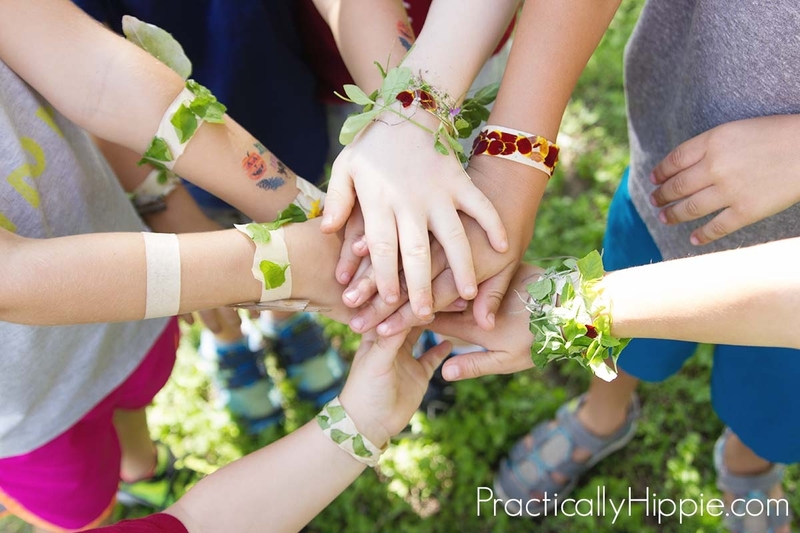 Make a nature wreath, go on a listening walk or sit and tell stories or sing songs. I keep a stash with a roll of masking tape, a few lengths of yarn, and mini bug boxes in our hiking bag and those items never fail to inspire creativity in kids. Awesome guide! I love the printables!! !